Some Peek in the Stacks blog posts are authored by CSUN students who work in Special Collections and Archives in the Oviatt Library. This week's post was written by Danielle Medina, a student assistant in the International Guitar Research Archives (IGRA). Danielle is a junior majoring in Communications. 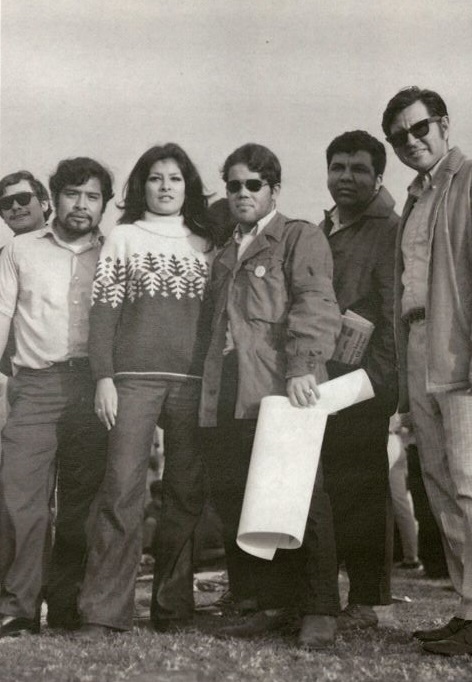 California State University of Northridge (CSUN), a very diverse university, developed some of the very first ethnic studies courses in the nation and has the one of the largest ethnic studies programs in the CSU system. Although many students and faculty today appreciate the required cross-cultural classes, they may not understand how difficult it was to get to where we are today. 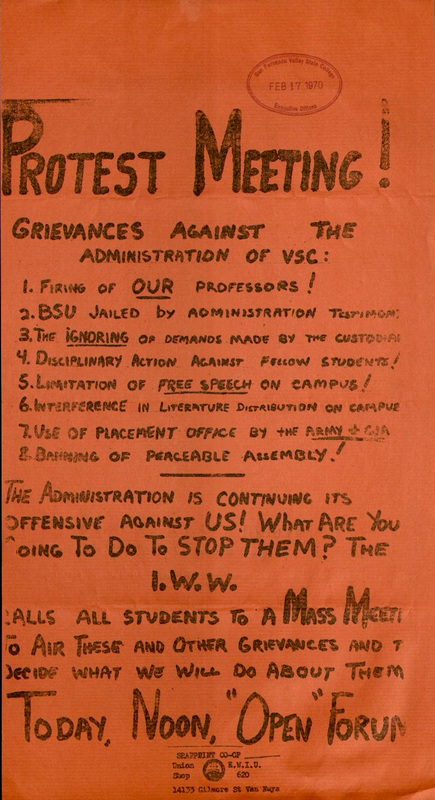 In the 1960s students began to express their concerns through protest and activism to campus officials and the community. 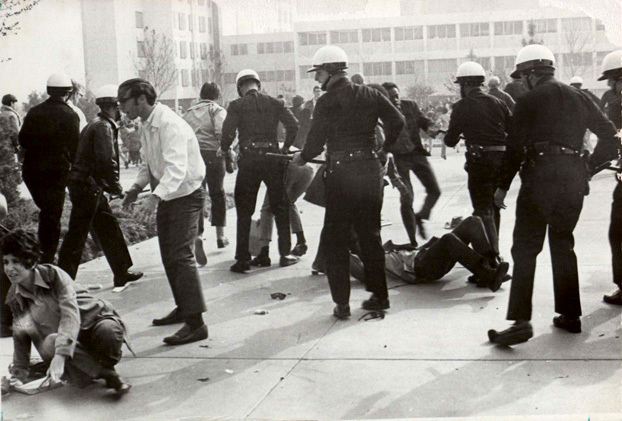 These movements are documented by John Broesamle's Suddenly A Giant: A History of CSUN, which describes the extensive work students did to organize, create proposals, and articulate their demands for changes to the curriculum. For example, students questioned the closed-door policy of the Faculty Senate, and demanded to be present and informed of decisions being made about student concerns. 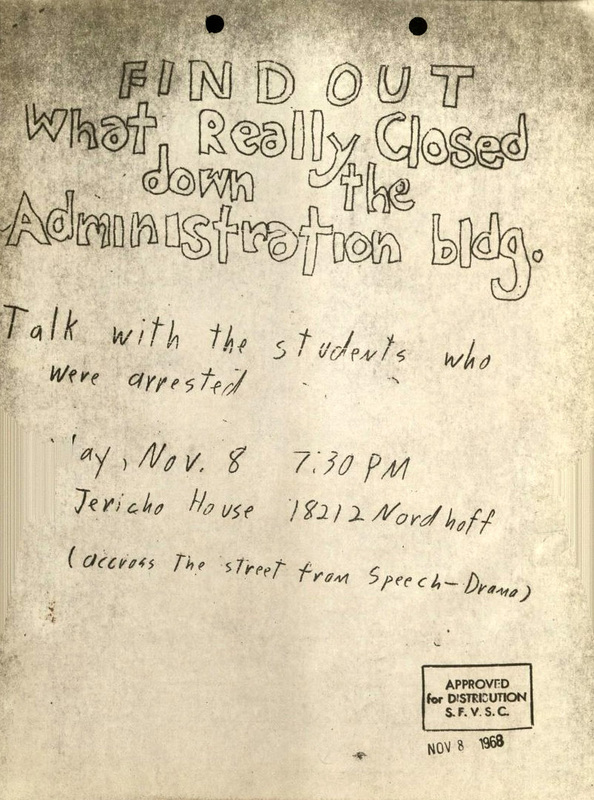 The Dr. Richard Abcarian Campus Unrest Collection, includes records that document the establishment of the ethnic studies programs and programs like the Education Opportunity Program (EOP) that offers assistance to students who might not otherwise be qualified to attend. These documents provide a record of the collaboration between faculty and students to develop the Mexican-American Studies and Afro-American Studies departments. It also documents how leaders in the Chicana/o and African-American departments worked to win the support of University administration and create a more diverse faculty across campus. 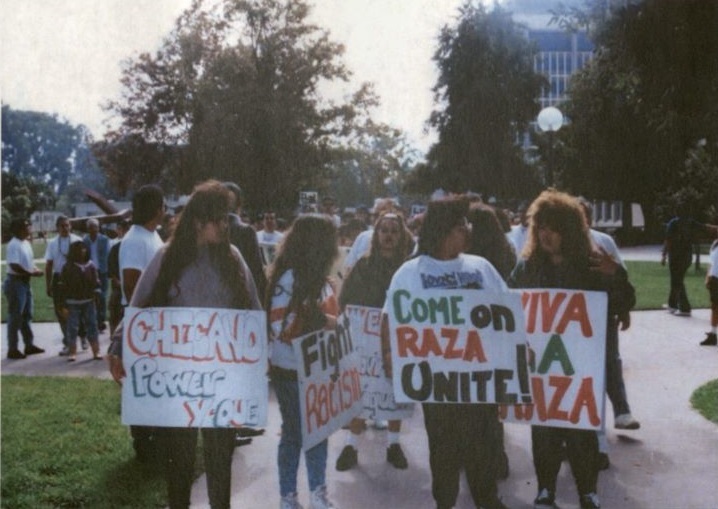 The Campus Unrest and Related Campus Activities Collection includes resolutions that state CSUN will actively recruit Chicana/o and Black counselors, the Univeristy President will reconstitute the College Advisory Board making it more diverse, and will recruit extensively for Black and Chicana/o students for the fall of 1969. The Black and Chicana/o students not only saw very little representation amongst the staff but in the student body, as well. 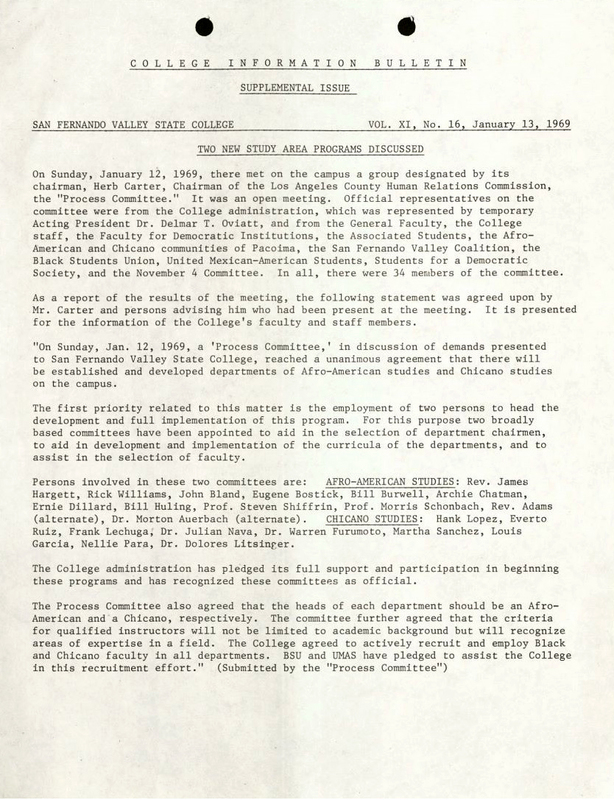 The faculty and students came to an agreement that the University would actively engage in admitting minority students beginning in the fall of 1969. Student actions opened the discussion for inclusion not only within the Chicana/o and Black community but with other minority groups like Asian-American students. In 1989, the Asian Pacific Students Alliance (APSA) articulated the goals they had set for themselves through the Asian American Studies Program (AAS). One year later, CSUN’s Education Policies Committee voted on the curriculum change which included the Asian-American Studies Department. In 1992, the Asian-American Studies minor was officially established, then three years later a Bachelors and double major curriculum was offered. Fast forward to present day, the ethnic studies courses offered on the CSUN campus are extensive. This includes courses across many disciplines such as Africana Studies, American Indian Studies, Armenian Studies, Asian Studies, Asian American Studies, Central American Studies, Chicana/o Studies, Italian Studies, Japanese Studies, Jewish Studies, and Middle Eastern and Islamic Studies. The inclusion of courses representing many different ethnic groups helps students to learn about their own or other cultures, and become more knowledgeable about the world in general.